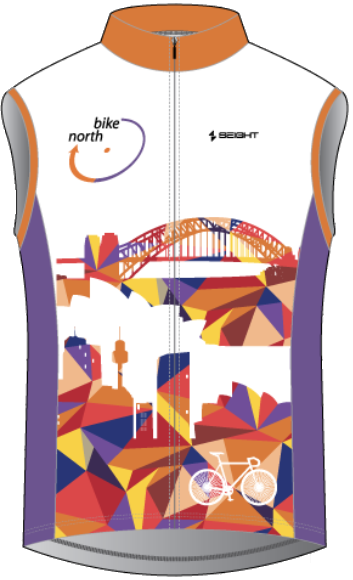 Bike North updated its Jersey design in 2017. In 2018 two Gillet (Wind Vest) designs were added. 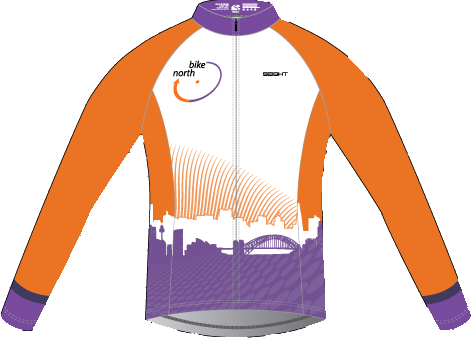 The jersey is a modern design by Bike North member and ride leader, Alanna Rados. The design incorporates the Bike North primary colours and distinctive logo. It also pays homage to our city landscape and the humble bicycle. A General and ‘Vivid Special’ Gillet was added in 2018. The jersey is available both short sleeve and long sleeve, male and female sizing, as well as various ‘cuts’ and fabrics. Gillets are available in Standard and Pro. 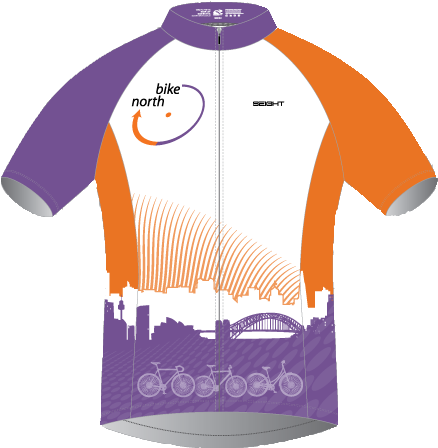 For the initial purchase all Bike North members will receive a $35 subsidy, on top of supplier discounts, with prices for a standard short sleeve jersey starting at $43.75 + $15 standard shipping direct to your door. The jerseys will be sold via the suppliers ‘Team Shop’. Brief details are below with full information available via Jersey Project PDF. See https://www.seightcustom.com.au/custom-cycling-clothing/size-charts for the Seight sizing chart. The Team Shop URL is https://www.seightcustom.com.au/custom-cycling/myteamshop/bike-north/. Refer to the weekly news for the Team Shop password. 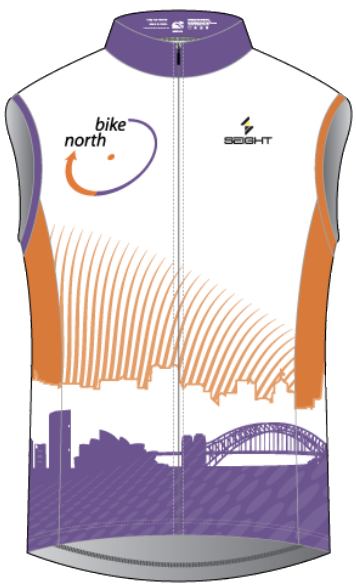 For all queries on clothing purchasing a clothing via the Team Shop please contact clothing@bikenorth.org.au. The current run of orders will next open TBA. Jerseys and Gillets will be delivered 4-6 weeks afterwards.